We are writing this newsletter from Port Nolloth. It´s been a while since our last newsletter and a lot has happenend. We left Mafikeng after 5 weeks, 300mm´s of rain, 2 cases of African Horse Sickness, a stolen laptop, camera and money and finally headed west again along the Molopo river and into the Kalahari! Our route took us along the borders of <?xml:namespace prefix = st1 ns = "urn:schemas-microsoft-com:office:smarttags" />Botswana and Namibia towards the West Coast. We camped our way through the former Boputhatswana homeland and thereafter were hosted by many farmers. Many of the farmers in these parts were using horses to work their cattle and sheep. The Kalahari veld is very sensitive and vehicles are destructive, destroying valuable grazing. Generally farms are huge as the carrying capacity is very low due to the low rainfall. 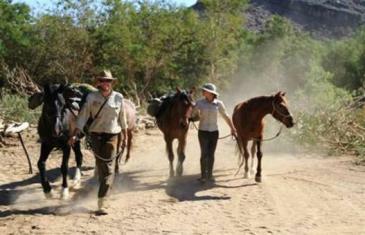 It was very special for us to ride through the beauty of the Kalahari and experience it at a horses pace. The higher than normal rainfall over the past 6 months had turned the Kalahari into a paradise!! Red sand dunes were covered by beautiful, long, silky bushmen grass that caught the late afternoon sun and turned the landscape gold. It is magnificent and we both agreed that this is one of the more beautiful areas we have ridden through. In June, Mom and Dad came to visit and help us through the remote and dry parts of the Kalahari next to the Namibian border. This was just as well as the distances between farmers were often more than we could ride in a day. We camped along side the road under incredible starlight and it was a treat to share this experience with Mom and Dad. In Noenieput we met Barry and Annette Burger - Kalahari Sending. Barry is a missionary on horseback. It was special to meet him and to share knowledge of long distance riding. The recent movie release called "Tornado" is based on Barry´s true life story in helping an emotionally damaged horse and human. The horses were in heaven with unlimited sweet lucerne after months of dry Kalahari grass. The 6 of us have become very close. We are totally dependant on each other. To travel with horses for so long creates a bond that is hard to describe. A connection that develops with living side by side, hour after hour, day by day. Our relationship grew even stronger as we rode along the Orange river through the Richtersveld. We slept along side our horses without seeing people for many days. Just the 6 of us finding our way through the harshest terrain yet. Each day we realise more and more about horses! They are supreme creations! We rode along the Orange river with sand dunes on the Namibian side until reaching the Orange river mouth on the Atlantic ocean at Alexander Bay! This was a milestone for us having last ridden by the sea on the Indian ocean - the other side of SA, about 4200km ago! It was the first time that Fever and Tarwood had seen the sea. We arrived at the sea during spring high tide with storm surf and high winds! The waves were topping over into the lagoon behind. Not a great day to introduce 2 mountain inland horses to the sea! Roan and Himba felt at home as their home is along side the sea. We made our way from Alexander Bay down the West Coast to Port Nolloth where we are resting now. We are organising our route through the Western Cape. The Western Cape has different restricted AHS control zones. All horses entering the restricted zones in the Western Cape need an AHS vaccination record and a passport. When a horse moves from one zone into the next zone it needs to be re-vetted to get permission to move into that zone. We have decided to ride with our 4 horses into the Western Cape to the start of the restriction zones. From there we will box them around the zones to the Coast near De Hoop nature reserve. This will give them a few weeks rest and we feel it is the right thing for them. We need to use local horses from each zone and will look for suitable horses to loan or hire for these stretches. If anyone in the Western Cape can please help us with this, it would be a great help. We are also trying to organise a big riding day event at some location in the Western Cape to be held in the next 2-3 months. We would like to accummulate as many horses and riders as possible to ride together for a day against African Horse Sickness and to help horses in SA. We are hoping to organise the same event in P.E., East London and Durban. Watch our website for information on this! Anyone interested in assisting us to set this up please email us. Thanks to everyone that has helped us to get this far. It would be very difficult to do this without you.